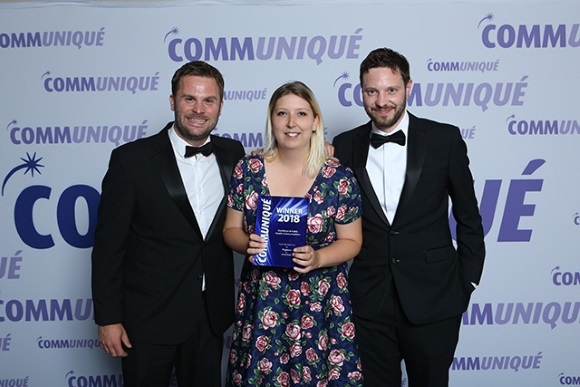 Pegasus, an Ashfield company, part of UDG Healthcare plc, is delighted to have won the Excellence In Public Health Communications and the Excellence in Media Relations awards at the 2018 Communiqué awards for its ‘Small Talk Saves Lives’ campaign. Pegasus also received Highly Commended for the prestigious Communiqué Communications Consultancy of the Year award. ‘Small Talk Saves Lives’ is a suicide prevention campaign developed in partnership with Network Rail, Samaritans, British Transport Police and the wider rail industry. The campaign was the first time rail travellers had been openly asked to spot, report or intervene in order to help reduce suicide – a significant shift in focus for this collective of organisations. ‘Small Talk Saves Lives’ tells the real story of suicide prevention, and every aspect has been developed and shaped by experts, people with experience of suicidal thoughts and those bereaved by suicide. Of the 5m+ views, over 60% were driven organically and the 300,000+ comments and likes were all testament to the level of engagement it generated. As a result of the campaign, one in two people who’d seen it said they would be more likely to intervene to help someone at risk of suicide. For the Excellence in Public Health Communications award, the judges stated that it was an “excellent campaign with clear goals and a genuine need”. They praised the campaign for being “outcomes driven” as well as for it generating a meaningful response, with good social metrics and a strong range of stakeholder groups. Fixed on its course to inspire healthy decisions through creative integrated communications, Pegasus has built a team of nearly 140 people working with a ‘health first, sector second’ approach. The agency’s capability spans research & insights, strategic planning, media & influencer relations, creative services, digital & social marketing and corporate services.